Happy New Year to all the members of the wonderful, wonderful group Bread Bakers. I’m so glad to be part of a group where we learn so much about not only different breads and techniques but get to know each member more through their blogs, culture and festivals. Pavani of Cook’s Hideout wanted us to begin the new year with some healthy breads. A great theme Pavani, can’t wait to check out what other participants have baked. I decided to use amaranth as my healthy ingredient. I made Amaranth Flatbread for the first time and it turned out so good. I’ll probably use that as a pizza base or make a focaccia next time. I made an apple salsa to go with the flatbread and the family enjoyed it as a starter with some wine. Amaranth is not a grain but rather a grain like seed. We use the green leaves to make curry or a dry vegetable coupled with egg plant or lentils. Amaranth or rajgira as its known in Hindi is used to prepare food during fasting days which demand a grain and pulse free diet. Amaranth seeds can be used like rice to be served with curries, lentils etc.Its a great replacement for oats as breakfast. Amaranth can be used in the seed form or as a flour. Amaranth is gluten free, helps to lower cholesterol, has anti inflammatory properties, helps to lower blood pressure,is a rich source of protein (ideal for vegetarians), is rich in lysine(helps the body absorb calcium, produces energy and helps build muscles), good source of fiber, boost immune system, is a good source of Vitamins A,C, E, K, B5, B6 and is a rich source of minerals like calcium, magnesium and copper. To work with amaranth flour, one needs to add another flour or boiled potato(sweet potato or tapioca) to make it more pliable. I added wholewheat flour, another healthy product. Check out my easy recipe. Amaranth flatbread had a nutty, earthy taste and is not heavy on the stomach. Sift amaranth flour, wheat flour and salt together. Add dried herbs and yeast and mix well. Add honey to 1 cup warm water and stir it well. Using the required amount of water, make a dough. Let the dough rest covered, for 15 minutes. Dust the work top with some flour. Knead the dough for 5-10 minutes until its smooth. If it sticks to your hand use small amounts of the measured oil. Shape the dough into a big ball and place it in the bowl. Cover it with a wet cloth or cling film and let it rise till its nearly double the size. Dust the work top again with flour. Knead the dough gently and divide it into 2 parts. Roll each part into a ball. Using a rolling pin or your hand, roll/pat it out into a 8-9″ diameter circle. Grease a baking tray lightly. Place the flatbreads on the tray. Bake for 10-15 minutes or until it is light golden in colour. Let the flatbreads cool down a bit on a wire rack. Cut into wedges and serve with your favourite dip, cream cheese or salsa. Use the flatbread as a pizza base. If the flour sticks too much to your hands, add a bit more flour or use oil to knead the dough. To make apple salsa, chop a big apple finely. Add one small finely chopped onion, a few mint leaves, 2-3 tbsp lemon juice, salt, pepper and chilli flakes. Mix well and serve. Can use a frying pan, griddle or tawa to cook the flatbreads. These look so good, Mayrui. I've never baked with amaranth, but can't wait to try. I'm thinking I might make a version of my Oatmeal Crispbread using amaranth instead of oats. Happy New Year to you my dear! This is a wonderful group isn't it? I can't wait to try this, and try working with amaranth. Wonderful post. I can use more recipes for amaranth! This flatbread looks delicious. Salsa too! I have used amaranth, but never baked with it. This sounds like a great idea!! Thanks for sharing this recipe with us! Wow, yeasted flat bread with amaranth sounds so innovative and delicious. Never tried it in baked bread. Will have to try it some time. These look super tasty! I've just bought amaranth flour and seeds for the first time – currently experimenting with it to bake a sourdough loaf with 80% wheat and 20% amaranth flour. Thanks for your post, really interesting read! This flatbread looks lovely! I've yet to work with amaranth. Good to know that I need to add another flour to it. But I'm definitely looking forward to trying this. This bread looks delicious! I can definitely see so many ways to serve it too. I haven't used amaranth yet but it's on my list! 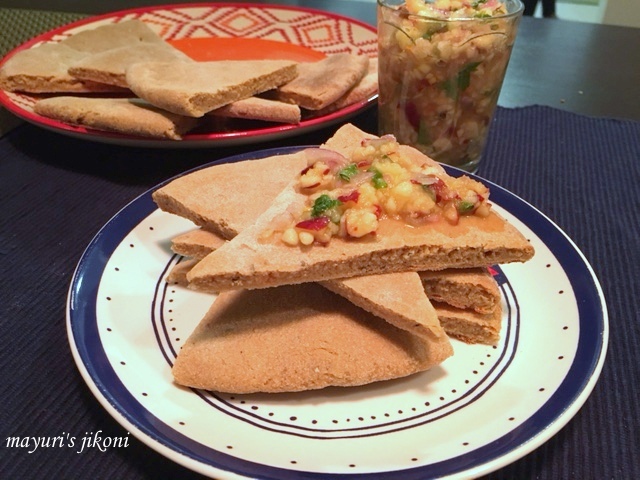 what a healthy and great looking flatbread – perfect for hummus! Great idea Eileen, worth trying out the recipe of crispbread with amaranth. It definitely is Karen I love learning from all of you and every event has me drooling over a bread :0 We use amaranth to make parathas but usually add boiled and mashed potato. Cindy I too am trying to find out more recipes with amaranth. We make parathas by adding salt, spices and boiled and mashed potato. Shruti its the first time I used it for baking and was really happy with the end result. I'm sure you'll love it Pavani, try it. Thanks Pam, would love to know how your bread turned out. Thanks Julie. Try it some day, it has a lovely earthy nutty taste. Thank you Mireille, also loved your sweet potato bread with millet. Super healthy bread and this my daughter's favorite.